“Manners maketh man” are the words that the Kingsman, an elite British spy organisation, live by. Saving the world is good and all that however, saving the world while looking sharp and acting like a gentleman is exactly what made the world fall in love with them when they first burst on to our screens in 2014’s Kingsman: The Secret Service. Would they be able to recapture the same magic in this sequel though? 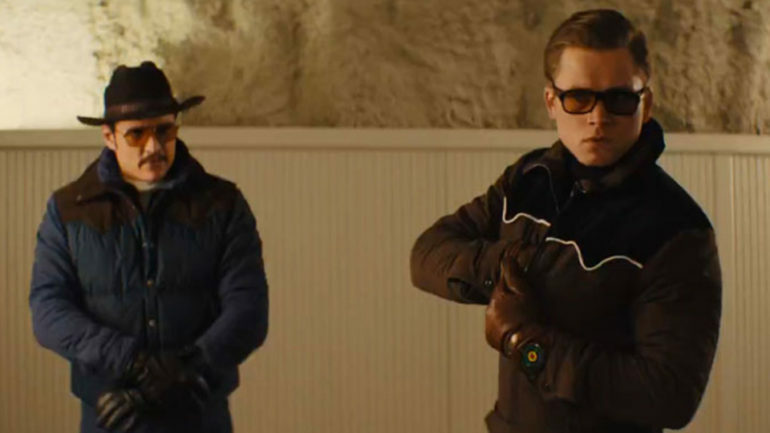 Eggsy (Taran Egerton) and the rest of the Kingsman must stop the maniacal Poppy Adams (Julianne Moore) from holding the world hostage. To do so, they must team with an allied spy organisation from the U.S. known as Statesman. Opening with a pulsating action sequence that finds Eggsy try and escape enemies in a black cab through the streets of London, Kingsman: The Golden Circle soon becomes a bit of a bloated affair, its near two-and-a-half hour runtime way too long for a film of this ilk. It’s the array of subplots and over-indulgence in Elton John scenes that drag the film down a level. There’s still plenty of fun to be had mind, Matthew Vaughn certainly not forgetting the comic book roots with both incredibly over-the-top action and corny dialogue aplenty. It’s foul-mouthed and crude, the Glastonbury tent antics being high on the list of scenes that will most likely receive complaints however, the energy that the first possessed is sapped by the overbearing narrative. If you’re expecting to see something to rival the church scene from the first film then you’ll only leave disappointed but I’m glad they didn’t just try and copy what was so successful before. Free Bird suited the craziness of that scene incredibly well and Vaughn finds another musical number to perfectly accompany such a pivotal sequence in John Denver’s Take Me Home, Country Roads. To say which scene would be a pretty big spoiler so I’ll let you discover it for yourselves. Coming to the performances, this is a well performed sequel that sees a number of favourites return alongside the new cast who fit the series seamlessly. Taron Egerton proves again why he’s one of the most sought after younger actors working today, maintaining chemistry with whoever Eggsy crosses paths with. Julianne Moore is clearly having a ball as the villain of the piece while Pedro Pascal delights as Agent Whiskey, the Statesman agent ordered to help Eggsy put a stop to Adams’ plan. Mark Strong, Channing Tatum, Colin Firth and Jeff Bridges ensure the film remains high in entertainment value while Elton John’s cameo will have you laughing out loud, even if he does show up a few too many times. Kingsman: The Golden Circle retains the fun factor a film like this requires but it’s the drawn out narrative that makes it suffer a little. Interactions between the Kingsman and Statesman leaves me excited for the potential of a third film where my best advice to everybody involved would be to keep it simple. PreviousPrevious post: Barton’s Movie Reviews | mother!